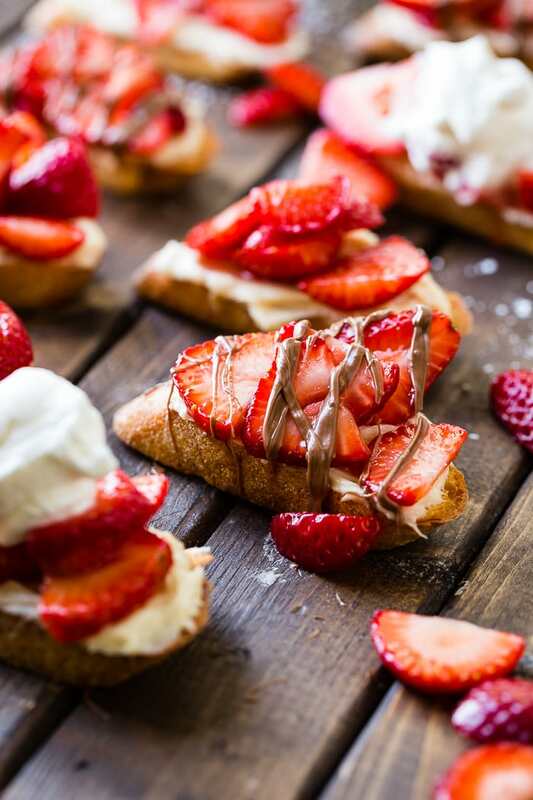 A lightly browned slice of bread that’s been brushed with coconut oil, an indulgent smear of brown sugar cream cheese, juicy, sweet strawberries and a chocolate drizzle for Brown Sugar Strawberry Crostinis. 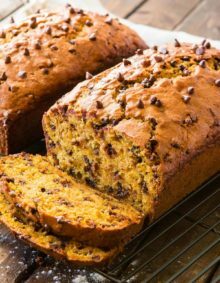 We are so, so excited for our very first READER submitted recipe!! 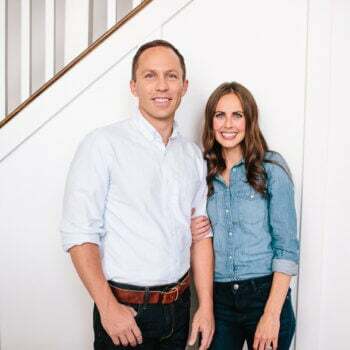 We’ve said for years that we love our readers and getting to know them on a more personal level, but even more cool is that we turn to our community for advice even over Google. (sorry google, please don’t hate us.) 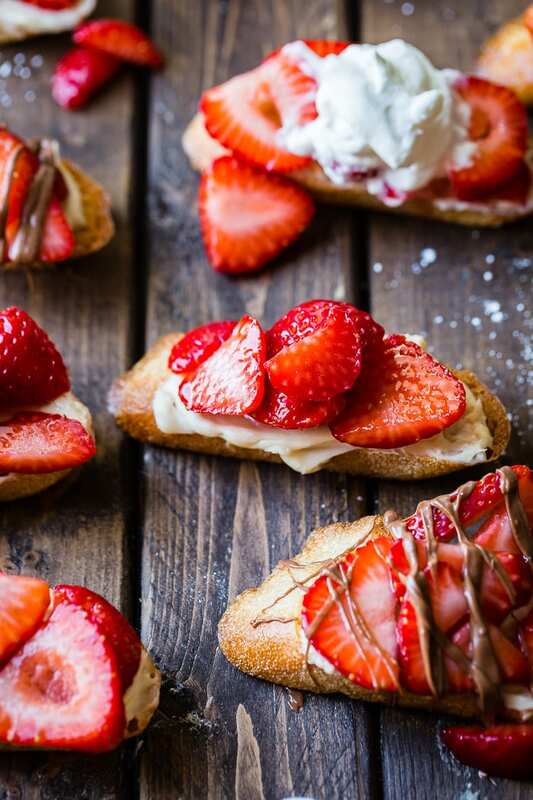 These Brown Sugar Strawberry Crostinis are the first of many recipes that will come straight from all of you! 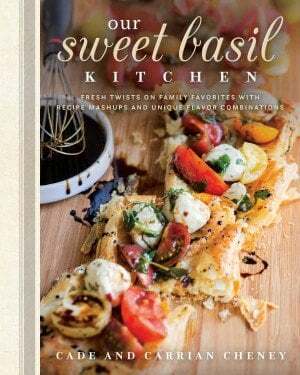 Last month we announced that you could be featured on oh sweet basil and we got such a great response of your favorite recipes to try! We snagged one from Kerri, and absolutely fell in love with her Brown Sugar Strawberry Crostinis! Anything that a bunch of women go crazy for at a baby shower is ALWAYS on my try list. That’s always the best food in my opinion so when we got the email I bought everything the very next day so we could give it a whirl. 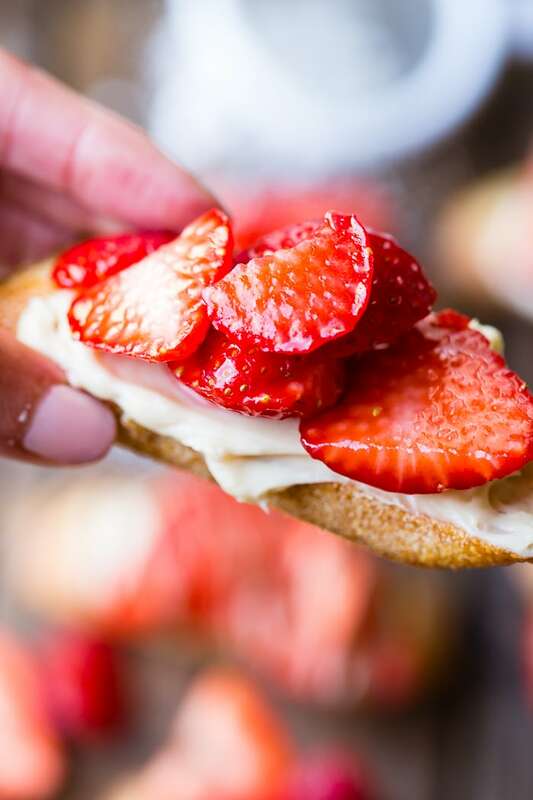 Kerri’s Brown Sugar Strawberry Crostinis could easily be considered a sweet appetizer or dessert, so it’s totally up to you. 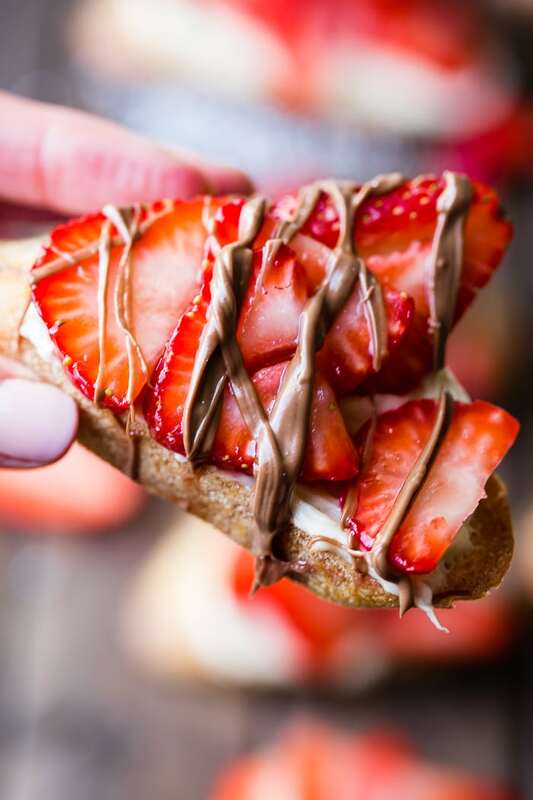 It’s a crisp slice of baguette with a smooth brown sugar cream cheese that you then top with sweetened, chopped strawberries and finally a topping of choice, though if you’re short on time you could totally stop at the berries and that’s delicious as is. The best part about this recipe, other than that it took 5 minutes to throw together is that it’s incredibly versatile. You can use any berry or topping that you please! Seeeee!! Isn’t that so fun! And I’m seriously not kidding, these Brown Sugar Strawberry Crostinis are my new go-to party food. Heck, they are my new go-to food! They are seriously mouth-watering!! There’s something pretty incredible about them and I’m convinced that it’s because you brush the bread with coconut oil instead of regular olive oil. There’s absolutely no coconut flavor but there’s a little something to them that is just magical. Combine that along with the smooth and dreamy cream cheese and those vibrant berries and it’s like a match made in heaven. Kind of like Cade and I… AWWWWW!! Crostini are small pieces of bread that have been toasted and are usually served as an appetizer. Crostini are made by slicing an artisan bread and then brushing it with a little oil or butter and browning it under a broiler until lightly golden. The bread is then cooled and served alongside dips, or stacked with toppings. I know you’re thinking, but which bread for crostini? 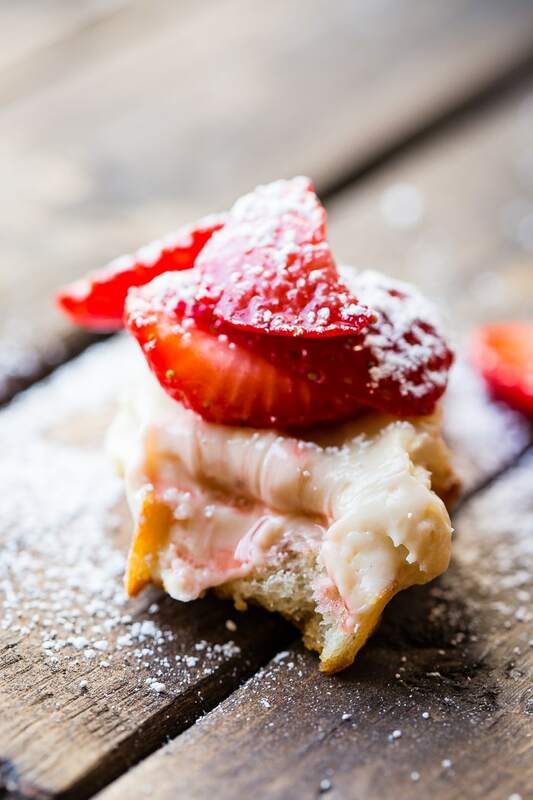 Since you’re serving crostini as an appetizer, or in this case the Brown Sugar Strawberry Crostinis are a dessert, you’re going to want the pieces small and crisp. Baguettes make the best crostini as they are small enough for bites and crisp up well in the oven. Just don’t over bake them which I do at least 50% of the time. They are small and can burn quickly if not watched. How Many Crostini per Baguette? Baguettes are not all created equal. When I first started cooking and trying out different appetizer recipes I noticed that many recipes called for a baguette, but never listed how many crostini per baguette so it made it hard to guess how many I needed to buy for guests. I can see the issue now, many stores sell HUGE baguettes that allow you to get up to 60 1/4″ slices from it, while other are half the size and you end up with 20-30 slices. It also depends on how thick you cut the slices, we’ve started to do a little bit more thick so they have a good chew to them. 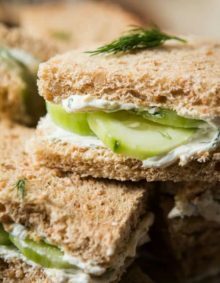 How Should Crostini be Stored? Crostini are best stored in a resealable bag or container. You want to keep the moisture out so they don’t go soggy. How Long Will Crostini Keep? Crostini stored in an airtight container will keep for up to 1 week. After this point you should dispose of the bread as they will start to turn and go bad. Can I Make Crostini Ahead of Time? Making an appetizer or dessert out of crostini is not that difficult at all, but even so, sometimes you need to cross things off of your to-do list before the day of a party in order to actually enjoy your party. So can you make crostini ahead of time? Absolutely! Make them a few days ahead of time and store them well until the party. I must warn you though, while crostini store well any recipe is always best eaten fresh so if it were me, I’d only make them as early as that morning. Now that doesn’t mean I wouldn’t make and FREEZE them. Wait, can you freeze crostini? In order to freeze crostini start by cooling them completely to ensure that they don’t steam in the bag. Place the crostini in a freezer bag and gently press out all of the air, and then seal. Wrap the entire bag in foil and place in the freezer for up to 3 weeks. Defrost at room temperature and it should remain crisp. 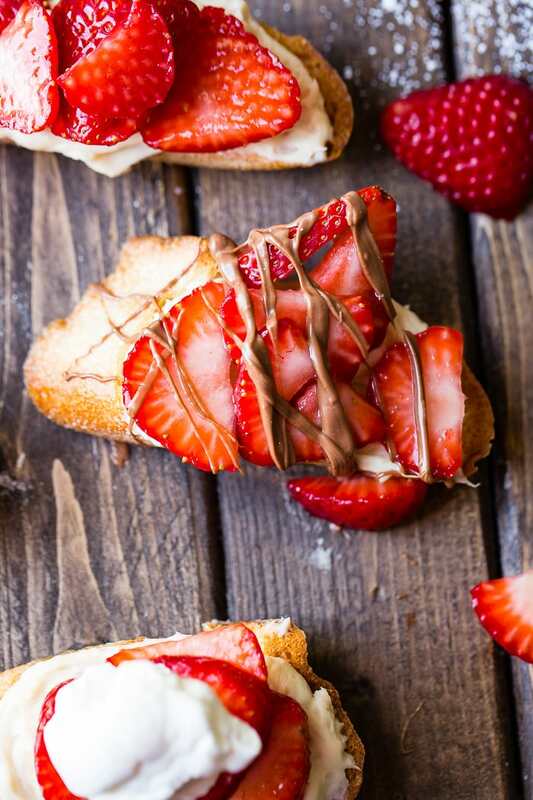 A slice of bread, an indulgent smear of brown sugar cream cheese, sweet strawberries, and chocolate drizzle for Brown Sugar Strawberry Crostinis. Chop the strawberries into small pieces and place them a bowl with about a tablespoon of white sugar. Stir to coat the strawberries. Let them sit in the refrigerator to macerate for 15-60 minutes. Set all the pieces of bread on a cookie sheet in one layer. Broil them on the first side for about 3-4 minutes or until golden brown. Then flip them over and broil the other side for an additional 2-3 minutes or until golden brown. Set them aside to cool completely. Blend together the cream cheese, brown sugar, powdered sugar, and vanilla until smooth and creamy. Once the toasted baguettes are completely cooled, spread some cream cheese mixture onto each piece. Then top each piece with a spoonful of strawberries. *I recommend using a slotted spoon to drain off the juice from the strawberries. Top with a drizzle of your favorite kind of chocolate, or dust with powdered sugar, or just leave them plain. 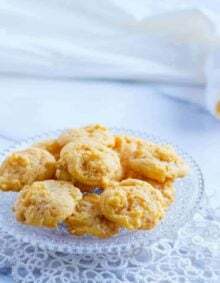 These are best when they are made immediately before serving. If they sit too long, they will start to get soggy. We found it even easier to use melted coconut oil with a pastry brush. It was hot in our kitchen so the second batch was coconut oil that had melted on its own and it was super easy. Yummy! I love this. I can’t wait. I will make a meal like that.